Is buying the Gionee S6s your next move? Why don’t you read about the Gionee S6s specifications in this quick review and know more? Read on! 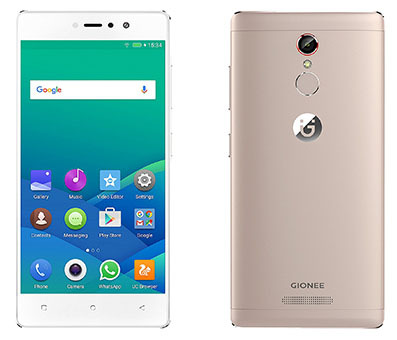 There has been a lot of entrants when it comes to smartphone launches in the Indian smartphone market and one of the recent launches has been the Gionee S6s. The phone is a successor to the previously launched Gionee S6 smartphone. The Gionee S6s takes pride in being a gift for the selfie lover with an 8MP front camera. The phone also offers a metal unibody build with decent specs on the paper. Let’s do a quick review of the Gionee S6s features so that you can make a buying decision. The Gionee S6s features a unibody full-metal design which is a clear indication that the design of the mobile phone is not far from the designs of today’s most phones. The smartphone brings nothing and delivers what is already in the trend. Going by the looks, it is a stylish phone that will prove that you are a part of today’s trend. Overall, the phone is an eye-catching one that won’t disappoint you with its design. The Gionee S6s sports a large 5.5-inch full HD display with 1920 x 1080 pixels resolution. The colours on the screen look vivid, sharp and good. Both indoors, and outdoors, the screen brightness is good. Using the screen under the sun is also fine. Overall, the phone offers better viewing angles and enjoying multiple types of media on it is a delight. The touch response of the screen is fine as well. The phone comes with a 13MP primary camera, and aided by an LED flash. It also offers a 5MP front camera. The primary camera can capture images with great colours and details with a rich output. However, some lighting conditions may mar the quality of the clicked picture. The night photography is decent, and you may experience some grain, sometimes. The camera that makes the Gionee S6s a phone to reckon with is its selfie camera. The 5MP selfie camera steals the show with detailed and clear selfies. The Face Beauty 2.0 further enhances the quality of the pictures when operated properly. With a selfie flashlight at your disposal, you can click decent night selfies. You get usage alternatives with screen flash, steady flash and normal flash to take care of clicking selfies in bad light conditions. The Gionee S6s features the 1.3 GHz Octa-Core MediaTek MT6753 processor + 3GB RAM to deliver lag-free and non-heating performance. The phone runs on the Android Marshmallow 6 Operating System. If you want to buy the Gionee S6s phone, you can expect a fine performance. The phone can handle multitasking easily. Even when it comes to heavy usage, playing some heavy games such as Asphalt 8 and more did not have any issues. The phone handled all like a pro. There may be some heating issues or frame drops after 30-40 minutes of playing the game, which is acceptable and fine. The battery prowess of the Gionee S6s smartphone is fixed at 3150mAh battery. The battery is non-removable and can deliver a day of use. The test result for the Gionee S6s battery came at around 12 hours and 45 minutes, which is good. The total screen-on time was found to be around 3.5 hours. The phone’s battery settings come with a power saving mode and extreme power saving mode. The 2A rated charges of the phone take around 2 hours to charge the battery fully. The Gionee S6s offers an excellent display along with a decent design. You get to click images with a nice pair of cameras that are the talking point of the phone. The battery backup is on par, and you also get an almost glitch-free performance. If you are looking to own a stylish phone with decent basics, you can go for the Gionee S6s. No need to worry about the budget if you wish to buy this phone on EMI without credit card and divide the cost over a tenor and pay affordable EMIs. You can use the No Cost EMI facility on the Bajaj Finserv EMI Network at any of the 60,000 partner stores to buy the phone with an EMI Network Card and pay no extra charges. You can also walk to a store submit your KYC documents along with a cancelled cheque to avail quick finance to shop on No Cost EMI. Bajaj Finserv has some pre-approved offers on a host of financial products such as business loans, home loans, personal loans, smartphone EMIs and more. You can check out your pre-approved loan offers by sharing some of your details such as name and mobile phone number.